The T. H. Leggett House is a fine example of a Queen Anne style residential structure. The variations in siding material, the irregular form, the variations in roof line, the bay windows, and most importantly, the witch's cap, illustrate the characteristics of the style. 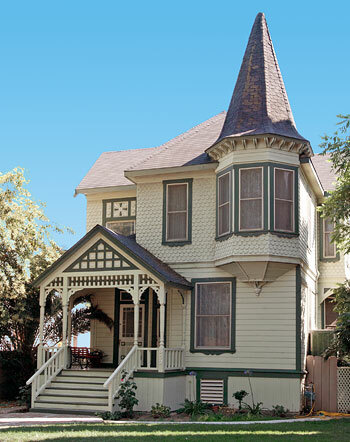 By the 1880's, the Queen Anne style had moved into the Central Valley of California. This house shows the transition of the area from a struggling pioneer community to a prosperous county seat. In the conservative community of Merced, this house was considered highly decorated and ornate. Herron built the house on a knoll high enough to escape the flood waters of Bear Creek which often escaped its boundaries during heavy rainfall. He sold the house to T. H. Leggett, an early settler, who served as one of the first postmasters of Merced. In 1894, the front parlor of the home became Leggett's Jewelry Store, the first such establishment in the city. The house remained a private residence until the 1930's when it became a rooming house. Later, in the 1950's, the building became a duplex apartment. In 1975, it was restored as a private residence. The house is one of seven surviving private homes built prior to 1900 in Merced and is one of the few historic homes in the city that have suffered only minor alterations.